If I have, in the past, failed to mention to you how much I absolutely adore pasta, and how carbohydrates are integral to my mental well-being, then I’ll say it again. I love pasta and I whole-heartedly thank the Italians for them! 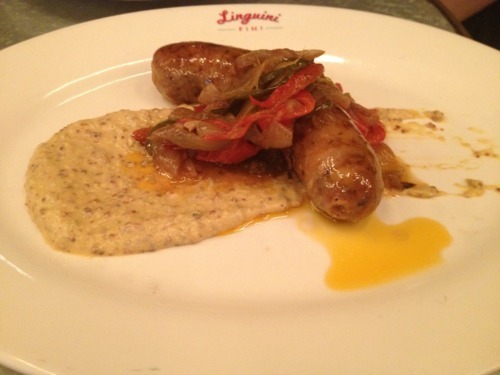 Therefore, you could imagine my excitement when I finally got to try Linguini Fini, a restaurant which is under the IHM group (owned by two New Yorkers Todd Darling and Robert Spina) and is famous for their casual and authentic Italian dishes. The restaurant is split over 2 floors, and reservations can be made for tables on 1/F, but not on G/F. Remember to make a reservation if you want to avoid sitting at bar tables! I went there for lunch and they had a 3 course set lunch for $198. Seeing how the restaurant boasts its “value-for-money” Italian food and given its location in Sheung Wan (as opposed to Central), this did not seem like a bargain at first; however, the restaurant does not impose a 10% service charge, so the final bill is actually not too bad! (1) The waiter recommended these two starters to us. The Homemade Spicy Pork Sausage was excellent. The meat was slightly chunky, so the sausage had a more chewy and fun texture than normal Frankfurters. The garlic mustard sauce was tangy, and the roasted onions and peppers on the side were delicious. (2) What really made my day was this White Gold Bar! Mozzarella is already one of the greatest loves of my life as it is. Then wrapped in herb bread and deep fried? It was simply pure bliss on a plate! 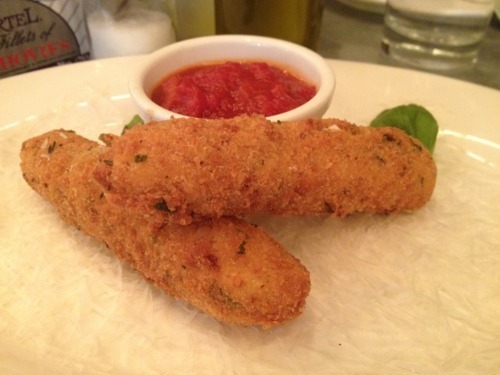 The marinara sauce, which was refreshing and not too citrus and had soft pieces of tomatoes in it, was a great complement for the crunchy mozzarella sticks. I’ll never forget how the cheese beautifully oozed out as I cut into them! 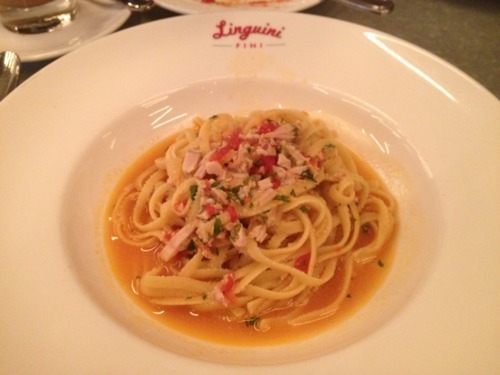 (3) My friends have been raving on and on about the amazing pasta at Linguini Fini. But for me, it was a bit of a disappointment! For my main course, I ordered the Arthur Ave. Linguini with Clams. The pasta itself was freshly made and perfectly al dente, but the sauce was truly insipid. Perhaps here in weight-conscious Hong Kong, we much prefer food that is lighter on the waistline, but you simply cannot cook pasta without enough olive oil! You can see in the photo below that the sauce was quite watery. 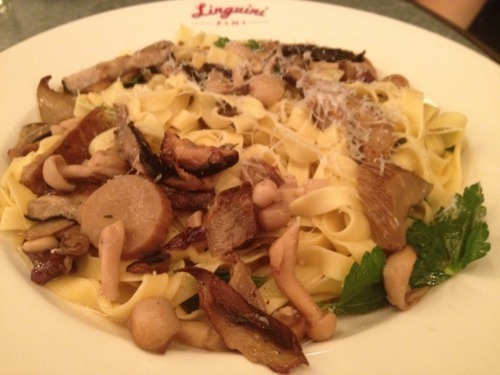 (4) As for the Fettucine Funghi, the sauce was also watery, and the mushrooms were rather flavourless. 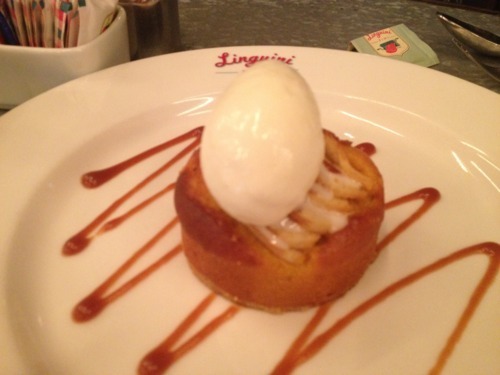 (5) The Apple Crostata was delicious and was topped with yogurt gelato,which was creamy and smooth. 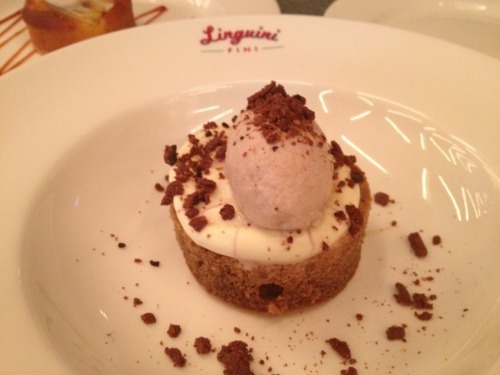 Their Tiramisu was sort of like a normal tiramisu with the usual proportions of sponge cake and mascarpone reversed – it was made of a coffee-flavoured cake with a thin layer of mascarpone on top, sprinkled with ground chocolate. (6) The set lunch comes with a coffee or tea, and you could pay $10 to upgrade to a Latte or a Cappucino. 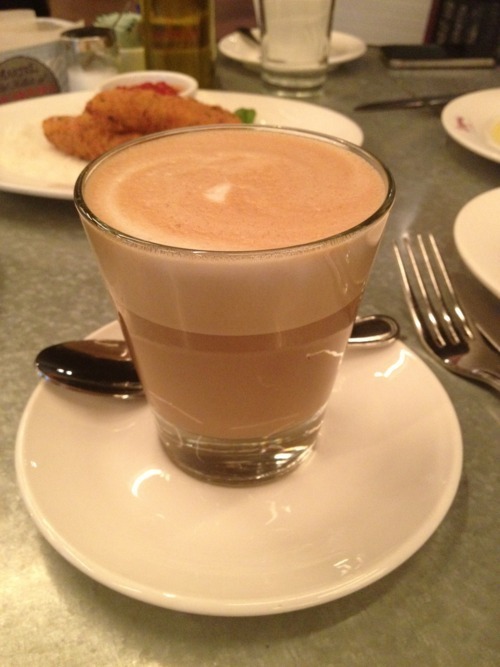 I adored my Latte, which was sweet and aromatic. Conclusion: Even though the pasta was a bit disappointing, I would totally come again if only just for the rustic atmosphere, satisfying food and the deep fried mozzarella sticks!